Before the days of the internet and games consoles, people had great fun in their leisure time – without any of the environmental damage that accompanies many of today’s leisure pursuits. These days, so many games seem to need a console or DVD player – and that means using electricity. For example, a night in with friends could involve a board game like Trivial Pursuits, a game of cards or even charades, which doesn’t need any equipment at all. Or why not find out why so many older people are into games like bridge and chess? They really do become addictive and certainly work the grey matter. 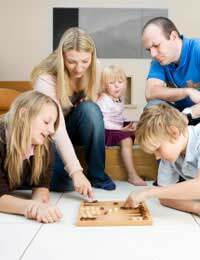 Make sure children learn about the delights of a family game around the table – or a quick game of rounders in the garden instead of spending all their time on video games. Most children today don't get enough exercise and surveys of school children have shown they would often prefer to do something with their parents instead of being left alone with a games console. If you’re a movie buff, why not rent a film instead of buying? In many cases, you’ll never watch the film again so why have it lying around the house or going to landfill along with millions of others that find their way there on a daily basis? Lots of bookworms buy new books on a regular basis but they end up going for recycling after just one read. Join your local library instead and take advantage of the thousands of books available free of charge. If you regularly buy CDs, you could save money and avoid all the energy needed in production (not to mention the recycling nightmare) by downloading music tracks. If the weather’s warm and you are having family and friends around for the afternoon, use your normal cups, plates and cutlery rather than buying paper or plastic throwaways. If you’re having a meal out, try to support a local restaurant that invests in organic food and uses local suppliers. That way, you’ll be helping the local economy and cutting down on food miles. Ask the waiter for simple tap water rather than a bottle. UK tap water is the envy of many countries. It is safe to drink and often tastes better than bottled spring water. It will save you money and you’ll be helping to cut down on the masses of glass and plastic bottles which go to landfill. Of course a good restaurant will be recycling its bottles but energy is needed for recycling whereas tap water produces no unwanted waste! If you are planning a drink at home with friends opt for lager or cider in glass bottles rather than cans. The power needed to produce them is much less and glass is easily recycled. When your “leisure time” turns out to be gardening or a spot of DIY don’t invest in tools that you’ll hardly ever use. Join a local community or sharing group like Just for the Love of It where people lend and borrow things like wheelbarrows, electric drills, saws and pruning shears. Finally, if your mower is in need of replacement think about buying a traditional hand-powered mower. It will cost less, it won’t use electricity/petrol, it will be quieter and you won’t need to worry about the lead not reaching to the top of the garden. On top of that, the extra effort involved makes it great exercise!